The Snowy Scheme was designed to cope with large variability in inflows. 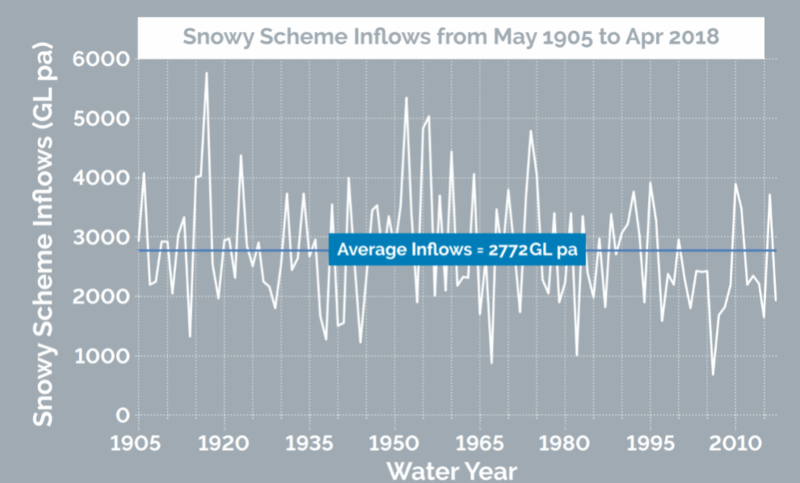 In the last 110 years of data, inflows have ranged from 683 gigalitres (GL) seen in 2006/07 during the worst drought on record, to 5761GL almost a century ago in 1917. The long term average is just below 2800GL. The total volume in Snowy Scheme storages is massive and it would take a number of consecutive years of above average inflows to return our total storage volumes, particularly Lake Eucumbene, to above average levels. We can expect to receive around 50% of our inflows from snowmelt and rain during spring, so a bad snow season can have a significant impact on the total inflows for the year. Snowy Scheme inflows for 2017–18 were 1,927 gigalitres, which is about 70% of the long-term average of 2,772 gigalitres. As we received below average inflows in 2017-18 our storages remain below long-term average levels.